Prepare a Business Report on Global Strategy Analysis of Maxis Communications. The aim of the report is to make a global strategy analysis. The company to analyze the different strategies that are to be followed to enter a new market is Maxis Communication- a Malaysia-based organization. The country that is chosen for Maxis to enter is India. The reason highlighted by this report is that India is the epitome of the world. The report discussed the PEST (political, economic, social and technological) of country India to give proper reasons for selecting this country for expansion. Furthermore, the bilateral relation was also discussed between Malaysia and India. It was found that both the nations offer rich cooperation scope at the present macroeconomic conditions is positive and their particular policy regimes are conducive. The report also had identified the different entry mode strategies that Maxis can use, however, has focused on using the strategic alliance mode. It is suggested to form an alliance with Convergent India. VRIO strategy is being used to give a reason behind considering this firm. This entry mode can diminish variability of the problems. Finally, the conclusion of the report is made through recommendation. In the recommendation, focused generic strategy is suggested as a suitable business level strategy. This present study aims at analyzing the business global strategy of Maxis communication- the Malaysian company. A secondary analysis is conducted to explore the concept of global strategy using the online websites, articles and course books. The purpose of this report is to highlight the importance of such expansion, understand, which country is good for Malaysian companies to invest and analyze strategic alliance or partnership importance with the local firm. The author will also recommend some business level strategy that the Malaysian company chosen for the study need to follow. Global strategy prompts various strategies of business and high adoption of local business. However, presently the key challenge is to develop a single technique that can be linked around the world simultaneously whenever necessary maintaining the adaptability to adjust that methodology to the business environment locally (Global marketing strategy: past, present, and future, 2010). A global strategy includes a single method for the overall system of subsidiaries and partners, at the same time enveloping several nations and utilizing collaboration method crosswise over several nations. Organizations go global for various reasons yet the key objective is expansion or organization development. When an organization scans for new markets abroad, a worldwide technique can help differentiate and extend a business. The key factor here is the economic globalization, which is pushing the organizations to quickly grow their business sectors by incorporating customers from worldwide. Such development is conceivable to some degree in light of the fact that technological breakthroughs all through the 20th century rendered worldwide communication (Griffith, 2010). Maxis Communications is headquartered in Kuala Lumpur of Malaysia. It is a communications service provider. It offers various communication services, applications, and products. Presently, it is a holding company and offers telecommunication, fixed-line and mobile services in Malaysia. It additionally gives services related to broadband and the internet, and services related to wireless multimedia and possesses, looks after, forms, and works radio amenities, and related switches. The organization was once known as Binariang Berhad and in the year 1999, the name was changed to Maxis Communications Berhad. The organization was established in 1993 (bloomberg.com, 2015). The organization is enthusiastic about the market and innovate communication services that are effortless and ‘Always On’ for their clients and customers. Their integrated solutions are a convincing proposition, which empowers their clients to upgrade their business objectives. Moreover, they are additionally responsible for the community they work in. Through their CSR efforts, they enrich and develop partners, customers, and community and make work fun through environment-friendly practices (maxis.com, 2015). As the company is deciding to expand their business globally, from the perspective of a strategic management consultant it is suggested to expand their business in India. Culturally, India is the epitome of the world. With its substantial populace, it represents the unlimited diverse patterns of culture and physical components. It has the diverse culture and religions. With its rich and sublime heritage along with diverse religions, cultures, castes, traditions, customs, and languages, it has colossal opportunities for international companies and entrepreneurs to develop. The country- India is well-known for profoundly skilled workers who are proficient in English language and are very much aware of the western social societies and cultures. For understanding the country in detail, a PEST analysis tool (Appendix A) is used and explained. Politically, in the world the country, India is said to be the largest democratic countries. The Indian political environment is impacted by different interests of the politicians, government policies, and political parties. Therefore, the business environment in India is influenced by many multivariate political factors. The taxation system is also well developed (pestleanalysis.com, 2014). Economically, India is the 9th largest and 3rd largest country with the nominal GDP and PPP (Purchasing Power Parity) respectively. It is forecasted that India would grow by 13% by 2050. 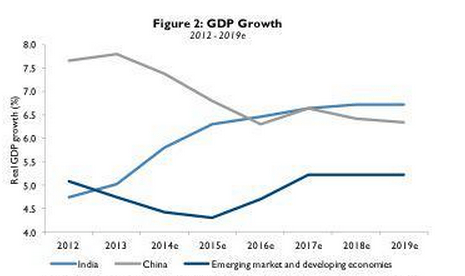 By 2016, the GDP of India is likely to exceed China’s GDP. In addition, it is forecasted that the India’s GDP is likely to increase by 6.3% compared to other developing or emerging economies as shown in the below graph. Furthermore, the corporate earnings of India are forecasted to exceed MSCI ACWI and MSCI EAFE Index (see figure 2). By 2016, there will be around 20% increase in Indian earnings (seekingalpha.com, 2015). Additionally, the bilateral relation is cordial between Malaysia and India. Both the nations offer rich cooperation scope at the present macroeconomic conditions is positive and their particular policy regimes are conducive. Both the nations have communications in different domains like cultural, social, political and economic activities; and have maintained a premise in different universal fora including the Commonwealth, G-77, G-15, NAM and the World Trade Organization (WTO) (Simi, Sindhuja and Ayswarya, n.d.). The bilateral trade between Malaysia and India remained at $12.5 billion last year with imports from that nation generally spread crosswise over electronic and electric goods, refined palm oil and petroleum crude and products. As indicated by the minister, the government aims to build the exchange between the two nations to $15 billion by 2015 (business-standard.com, 2012). Indeed, the Prime Minister of India Mr. Narendra Modi had said that there is diverse and many opportunities in India and welcomes Malaysian organizations wholeheartedly to invest in India (Nair, 2014). The companies, which are successful often, develop strategies that are unique compared to those of their home strategies. Generally, companies before entering into the new often use tools like risk assessment, portfolio analysis etc to understand the potential profit of the business. No doubt that these tools are helpful, however, some different strategies need to be used before entering the new market. According to…..